dust free keyboard: Everybody Everywhere Stomp Your Feet! Everybody Everywhere Stomp Your Feet! The album includes some poems from my book, which was published in 2008 by Flapjack Press, as well as some new poems for younger listeners. Many of the poems are set to music or a backing beat. 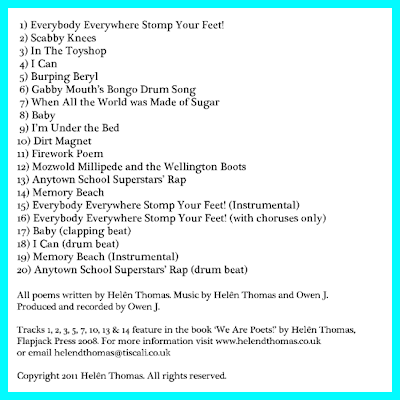 I use a lot of these poems in workshops when I visit schools and have included an additional six bonus tracks that can be used in workshops; these are merely the instrumental pieces and beats that accompany some of the poems on the CD. One of the poems is described as a 'rap' (get me!) and has a simple beat added to it, which should add to the fun in workshops when year six get to write and perform their own versions of the poem. 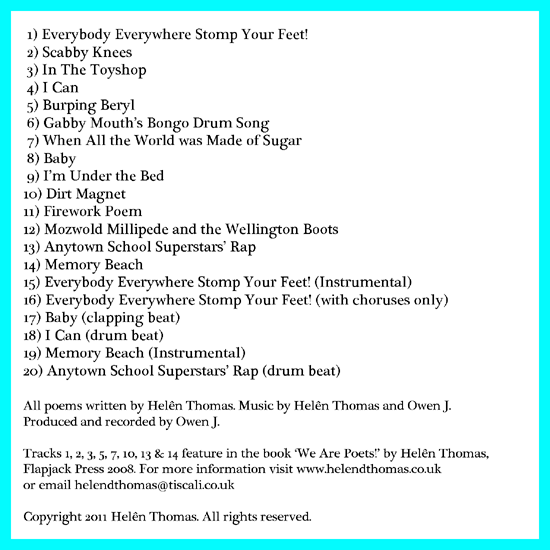 I hope that the album will be a useful resource for teachers when they are teaching performance poetry, as well as being fun for children to listen to. The song ‘Everybody Everywhere Stomp Your Feet!’ is always great fun when I visit schools. I get all of the children and staff to join in doing the actions which include flapping wings like a bird and waving hands in the air. The track has a thumping dance beat too which requires LOTS of funky dancing especially from the teachers! The album is available as a CD, download or as individual track downloads from the Bandcamp website. You can also buy the 'We Are Poet's' book and will receive the download album free of charge. I know. I'm deep like that.